See more reviews of home design books. 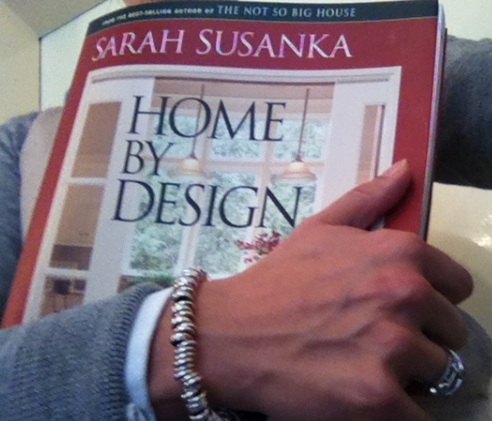 If you've been looking around at home design for any time at all I expect that you've already run into Sarah Susanka. She's a top architect in the United States and a very successful author on the subject of residential architecture. She's even been on Oprah! In the introduction of the book Sarah says this is the book she always wanted to write but she only felt her audience was ready for it once her 'The Not So Big House' book and its various spin offs such as Creating The Not So Big House and Not So Big Solutions for your home were such a runaway successes. You can view the plans for the Home By Design showhouse. In this book, Sarah tells us about 27 'concepts' of home design that can be applied during the design process to inject character and beauty into a home. It's about layout and the details that are built in to the fabric of the home such as windows, alcoves, pillars, built in shelving, stairs, front doors etc. It's not about paint color, fabric and wallpaper. Concepts, principles, home design recipes - call them what you will. Most architects call them 'patterns'. The movement of describing patterns of successful architectural design was brought to the public's attention in 1977 by Christopher Alexander (to whom Susanka has dedicated this book) in his seminal book 'A Pattern Language'. Alexander's is a thick, wordy book with only very simple illustrations. Jacobsen, one of the team involved with the pattern language project book went to to co-author a book called 'Patterns of Home' which brings Alexander's concept up to date and makes it more accessible and appealing with the use of images and floor plans. So does Sarah's book and Sarah's is the better book in my opinion. The book is split up into three main sections space, light then order and then split further into chapters where several of the concepts are presented. Just click on the image of the Home by Design book over at amazon to look inside, go in a few pages and you'll see the table of contents. The concepts are explained and further reinforced using are images and floor plans where relevant. Sometimes she uses a picture of a public building to demonstrate a concept. 1/1 for a well laid out and easy to follow format. Given Sarah's credentials and the fact that she'd had this book on the back burner for a good number of years, you won't find yourself arguing that any of the concepts she talks about are wrong. You might not like all the designs in the book but the explanations will allow you to think critically about home design, or think about how they might apply or be applied in your own home. Some of the reviews over on amazon complain that this book is a departure from the 'not so big' philosophy because some of the homes featured in this book are not small. Let me try and explain a little my take on it. The Not So Big House is a manifesto for how we might reduce the size of the houses we build and focus more on the design of our homes, spending less on space and more on detailing of the interior. So she was saying that for a particular budget - split it differently - design the space well and keep some of the budget specifically for beautiful detailing. Good design and beautiful detailing can and should be applied to homes of any size. The concepts presented in home by design can be applied to any size of home. 5/5 for quality of information. Sarah's designs and ideas are timeless but some of the furniture and decoration can make some of the pictures seem a bit dated - it's pretty easy to look past that though. Some reviewers complain that there are no dimensions on the floor plans. That must have been an editorial decision because very quickly a floor plan turns into a drawing with an overwhelming amount of information. Take a look at some Sarah Susanka house plans to get an idea of the spaces involved, or the Home by Design showhouse plans themselves. Not all of these quotes are from the book - some I picked up from videos and interviews I've watched or read. Back to the top of this Home by Design Sarah Susanka page. Copyright © 2012-2018 House Plans Helper. ALL RIGHTS RESERVED.